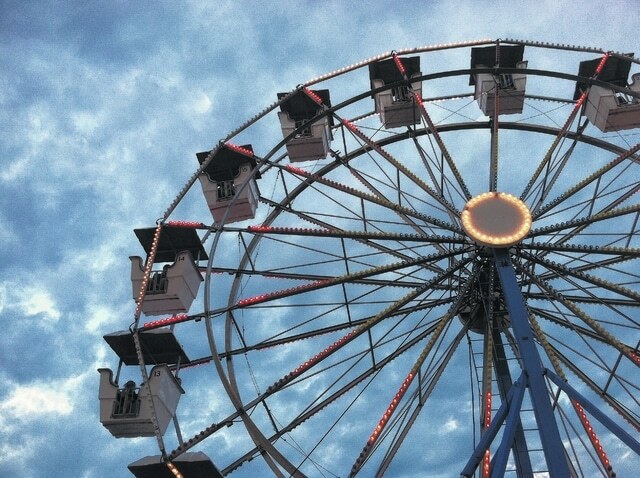 File photo Lots to see and do at the Scioto County Fair. The 2015 Scioto County Fair is scheduled for Aug. 10-15, with general admission to the fair $8. Fair organizers encourage area residents to take advantage of what you receive with admission. Robert Seaman, president of the Scioto county Fair Board, said this year’s schedule is jammed full of activities for anyone and everyone. “We are bringing some local musical groups in. They will play though out the day on the south end of the fairgrounds. We’re always looking for ways to; bring some of our local talent in. We started that a couple of years ago,” Seaman said. A complete listing and schedule of local entertainment appearing at the fair can be found at www.sciotocountyfair.org. Seaman said in recent years they started offering shuttle services to the parking lots, for those that may need assistance. “This is for folks to have easier access, to get back and forth from the parking lots. We plan on continuing to offer those shuttles,” Seaman said. Seaman said this year’s entertainment has a lot to offer the community. “I’m a big fan of the circus and that always gets a lot of children involved,” Seaman said. On Monday, Aug. 10, the entertainment will be the Motorcross Championship Series. Tuesday, Aug. 11, will feature The Willis Clan, Wednesday, Aug. 12, will feature The Swon Brothers, and Thursday, Aug. 13, will feature the Circus Continental. On Friday, Aug. 14, the group Lonestar will perform and Saturday, Aug. 15, will feature a Demolition Derby. “I think we’ve got some young talent this year and I’m really interested to see how it goes and what kind of a crowd they bring in,” Seaman said. Seaman said some of the things he’s looking forward to during the fair include, hopes for no rain. “It’s been raining throughout the month of July, so maybe in August we will not get any rain and we’ll have a nice fair,” Seaman said. Seaman said he’s also looking forward to seeing people at the fair. Included in admission are all grandstand shows and events as well as most rides. According to www.sciotocountyfair.org, Active Duty Armed Services Members are admitted free with official identification. Friday, Aug. 14 is Senior Citizens Day at the fair; those 60 and older will be admitted for $2. He said if you compare the price of admission to other fairs, the entertainment or rides might not be included. “We try to keep it as simple as we can and try to keep costs down. It is an expensive thing to put together, but we feel like it’s a fair price for a fun day of entertainment,” Seaman said. For more information about the Scioto County Fair and scheduled activities visit www.sciotocountyfair.org.